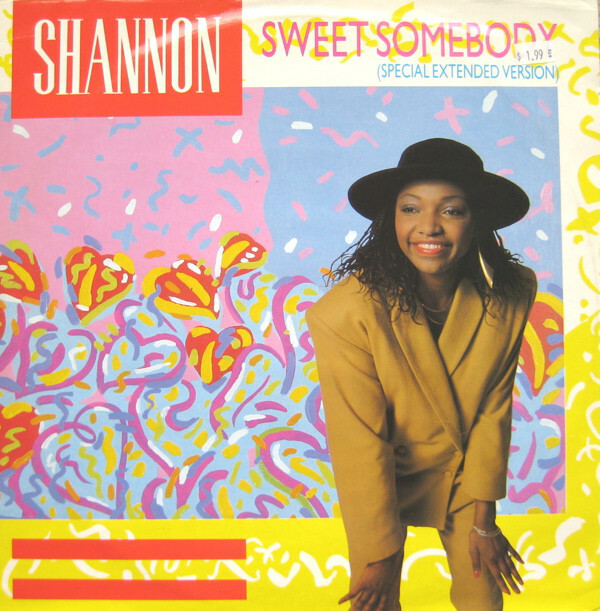 As much as "Let The Music Play" is 1980s par excellence and the quintessential bedrock to the Freestyle movement, I've always preferred Shannon's "Sweet Somebody" over it. Before you groan and protest, understand that I have always favored the more "unassuming" game-changing songs, and "Sweet Somebody" didn't need the bedazzle of a hi-NRG number or a great, commanding chorus line to note that the 1980s had arrived. Released as the fourth and final single from Shannon's debut Let The Music Play in 1984, the track was issued at a time when R&B was in revamp mode after the champagne bubbles of disco were dissipating. "Quiet Storm" was the devised genre for Black singers who liked to croon at a glacial pace, and for some singers, they were cornered into it, but "Sweet Somebody" marked a different kind of 'quiet' soul. It's the type of pop-tinged R&B that of course Michael Jackson was perfecting a la "Billie Jean", but to my ears "Sweet Somebody" also balances that aspect very well, even placing the seeds of what would be the supple sounds of Neo-Soul for the next decade. It's not there yet, but producer Chris Barbosa (who also produced "Let The Music Play") was kind of on to something with "Sweet Somebody", and Shannon too hints at the tonal control of such a genre as her voice, while not possessing this TA-DAH! display of diva power, still is emotionally effective as her voice is playful and earthy. For all its niceties, "Sweet Somebody" didn't do so hot on the charts. It didn't even chart in Shannon's native US of A (how rude), but the UK was kinder to its existence as it at least hit #25. Still chart positions are just numbers really, and its dismal treatment doesn't reflect its classic appeal. I guess what I'm saying in a round-a-bout way is that I've always loved how effortless this song sounds. It doesn't throw you into a synth stratosphere like "Let The Music Play" or has you wandering around in a foggy pixelated-forest like the haunting, "Give Me Tonight". It's all a really pure effortless melody that has some unexpected salt thrown in its honeyed charms, as its synths are arcade-ish, pricking and precipitating like electric rain, with a jangle of guitars lightly funking along. It's just the perfect type of rhythm for those who didn't want to leave the dancefloor just yet and wanted a cool down after the throwdown of "Let The Music Play" or for those who couldn't quite dance on beat (like the audience members in the video below...yikes) to get in the swing of things. For a long time I thought "Sweet Somebody" was a done deal. That Shannon did it, it was awesome, the end. It wasn't until I began getting more involved with music researching during my college years (aka the nights when I was procrastinating on my studies) that I found that "Sweet Somebody" was given its second wind by Key West artist (and later The Voice contestant) Donna Allen back in 1986. Actually "second wind" is probably too light of a description to describe Donna's take, as her version is more so a category 5 hurricane that snatches rooftops and hair follicles with the greatest of ease. Her version pretty much looks Shannon's "Sweet Somebody" up and down and goes, "That's cute..." and then proceeds to whip it into a exuberant dance number, that is bold on brass and sass, Donna's vocals clearly on that TAH-DAH! diva power I was talking about. The difference in tone completely changes the song's narrative as Shannon seems to eye her beau-to-be from a cool distance and a friendly smile, while Allen, on the other hand, yanks that shy boy off the wall, and thrusts him out on the dancefloor, to where he can watch her get down --- and Donna knows how to get down as her time as a former cheerleader for the Tampa Bay Buccaneers paid off in dividends for her vibrant showcase on Showtime At The Apollo. Okay. Donna and her hipwork and shoulder shimmies might be getting a little extra on this, but can you blame her? Songs like "Sweet Somebody" should make you get up when you're feeling down, make you have a smile on your face and just move your hips with abandon. Synth-soul of the 1980s is meant for that type of jubilation. It's why the sound gets duplicated a lot these days, as it works always in a pinch when you want to avoid the EDM route and not seem so 'mainstream'. And while such efforts are a nice reminder of what was, nothing compares to the sass and soul that acts like Shannon and Donna Allen brought to the genre back when R&B was coming-of-age in a new decade. So which version do I favor? It comes down to daily feeling, and no that's not a cop-out. Mostly I listen to Shannon's original cause its comfort food and has seniority, but whenever I want the kinetic heat to rise, Donna Allen's version is right there waiting for me to crank up and get my hips thrusting. If I had the mix-master skills I'd do a mash-up of these two versions, because they are both so on-point for me in terms of style and arrangement. Maybe if it got a re-fix treatment by one of these Black-American-culture-loving British production groups, maybe it'll finally get the hit status it so deserved?